PUTRAJAYA: Prime Minister Datuk Seri Najib Tun Razak today launched phase one of the 1Malaysia Housing Programme (PR1MA) which involves the construction of 42,000 houses on 20 strategic sites. He said eight projects were expected to commence this year and in 2012 on the 20 sites which had been identified in the Klang Valley, Rawang and Seremban. He said PR1MA was specifically for moderate-income Malaysians earning not more than RM6,000 monthly regardless whether they work with the government, the private sector or self-employed. "The government is aware of difficulties faced by the moderate-income group who cannot afford to purchase high-priced houses but at the same time not eligible to be considered for the existing low-cost public housing programme. "The implementation of PR1MA will be of help towards achieving the National Housing Policy's objective to provide sufficient, comfortable, quality and affordable housing," he said when launching PR1MA's first site at Presint 11 here. The first PR1MA scheme in Presint 11 provides 560 apartment units on 7.6 acres of land. The prime minister said that under the PR1MA scheme, each unit would be sold between RM150,000 and RM300,000 depending on location and size, and the size of each unit would be between 800 and 1,400 square feet with three bedrooms and two bathrooms. "The applicants must be first time buyers for the PR1MA scheme and need to occupy the house and they can obtain loan up to 105 per cent from selected financial institutions with a payback period up to 30 years," he said. Najib who is Finance Minister said that to prevent speculative activities among buyers whose intention was to sell for immediate profits, PR1MA house buyers were not allowed to sell the house within 10 years. "The government's real goal in implementing the programme is to see the people enjoy better lives by owning their own houses and not to give room for some buyers raking in gains from speculative activities," he said. The 1.7km single-plane cable-styled bridge across Sungai Johor. JOHOR BARU: The Government's investment arm, Khazanah Nasional Bhd, will unveil a multi-billion ringgit development plan for Desaru this year. Sources told StarBiz Prime Minister Datuk Seri Najib Tun Razak is expected to launch the project in Desaru either in the third or fourth quarter. The project will be undertaken by Khazanah's wholly-owned subsidiary Desaru Development Corp Sdn Bhd (DDC) which it acquired in 2010, inclusive of the latter's 1,618ha. In the pipeline for the development is the building of two international class hotels to be managed by two of the world's renowned hotel management companies and a world-class golf course. There will also be a theme park incorporating tropical, eco-adventure and water features and a convention centre to cater to the meeting, incentive, convention and exhibition segment. “The Prime Minster will also declare Desaru as the leisure and tourism region for Johor at the unveiling of the development plan,'' said sources. Khazanah's objective is to turn Desaru, on the eastern coast of Johor, into what Nusa Dua in Bali is now. Nusa Dua is known as an enclave for large international resorts in southeastern Bali. Work on phase one of the development project will take place at the sites of the Desaru Resort Golden Beach Hotel, Desaru Holiday Chalet and Desaru Golf and Country Club. A check by StarBiz to the three said properties recently showed that they have ceased operations and entrances to the premises were cordoned and parts of the structures have been pulled down. Sources said there were even suggestions made by certain parties in Johor to the Government to include Desaru as part of Iskandar Malaysia economic region since Khazanah took over DDC. Khazanah is developing Iskandar Malaysia's Nusajaya, one of the five flagship development zones in the country's first economic region via its controlled entity UEM Land Holdings Bhd. “However, the Government feels Khazanah should focus on the leisure and tourism sector in its development agenda for Desaru instead of multiple sectors,'' said the sources. Sources said Khazanah's role is to attract local and foreign investors to Desaru and they can either undertake the projects privately or on a joint-basis with Khazanah. Sources said the development of Desaru would also complement the US$20bil integrated downstream oil and gas complex in Pengerang by Petronas in Johor's southeast region. Dubbed Rapid or Refinery and Petrochemical Integrated Development, the project is aimed at building something larger than Kertih. Workers in the oil and gas-related industry at Rapid, including expatriates and their family, would need to unwind and Desaru, just a short distance away from Pengerang, is the perfect place for them to do so. The opening of the last 27km stretch of the 77km Senai-Pasir Gudang-Desaru Expressway early this month also reduces travelling time from Johor Baru to Desaru from two hours to about 45 minutes. The RM1.4bil expressway links Senai to Desaru in the eastern part of Johor and connects to Pasir Gudang at the Tanjung Langsat industrial area via the Pasir Gudang interchange. 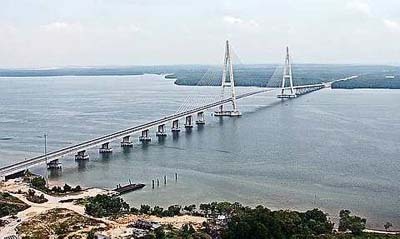 The last stretch includes the 1.7km single-plane cable-styled bridge across Sungai Johor, one of the longest of its kind in the world with a 500m span. JOHOR BARU: Tebrau Teguh Bhd is shifting its focus to high-end residential and commercial developments from low to medium cost residential projects previously. Executive vice-chairman Johar Salim Yahaya said it was a normal progression or transition for any developer to shift its focus to development projects that provided better yields. He said the company believed that it had made the right move after seven years of involvement and experience in the low and medium cost to medium cost residential projects. “The move is also in tandem with the positive demand for high-end properties within Iskandar Malaysia in recent years,” Johar told StarBiz after the company AGM recently. He said the long-term growth of Iskandar Malaysia would be the key contributing factor to help boost the Johor Baru property market. Johar said the company would benefit immensely from Iskandar Malaysia as its land bank was strategically located in the main growth nodes of the growth corridor. It has 413.53ha of undeveloped land and 12km water frontage within the Tebrau-Plentong river basin development with a net book value of RM591.93mil. “We want to maximise our land value and return with the right product and in this respect, water frontage properties always fetch good selling prices,” said Johar. The completion of the Eastern Dispersal Link Expressway and the Second Permas bridge within the next two years would improve connectivity and accessibility to the eastern part of Johor Baru. Johar said the company would be launching Botanica @ Bayu Puteri in October with the gross development value of RM165mil and the project on a 4.90ha site would keep the company busy for the next six years. The selling price of the apartment unit for the first of the four apartment towers with the built up area between 1,300 and 2,600 sq ft would be at RM300 per sq ft.
For the financial year ended Dec 31, 2010, Tebrau Teguh recorded RM3.63mil net profit on RM108.97mil revenue against RM13.62mil and RM35.45mil respectively for the FY2009. Stemlife Bhd (SLB)'s unit, Stemlife Properties Sdn Bhd (SL Prop) has acquired a vacant land, located within the Bukit Jelutong township in Damansara, Selangor from Mestika Bistari Sdn Bhd for RM6.79 million. In a filing to Bursa Malaysia today, SLB said the purchase of the land, about 59,078 sq feet in size, will be funded by proceeds from the company's Initial Public Offering and internally generated funds. The acquisition will enable the group, which is in the business of stem cell banking and regenerative medicine, to expand its laboratory facilities, it added. Malaysia’s property sector was cut to “neutral” from “overweight” at RHB Research Institute Sdn Bhd, which said the expectation of strong property sales and earnings growth have already been factored into the share price. “Sentiment will turn slightly negative and we expect demand starts to soften possibly next year,” Loong Kok Wen, an analyst at RHB, said in a report today.